Monday, April 22 until Thursday, April 25. Daily 8 a.m. until 4 p.m. 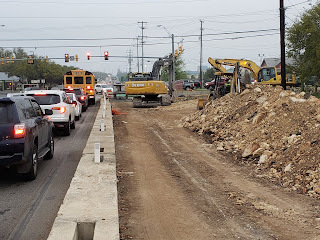 Eastbound left frontage road lane between Redland Road and Bulverde Road (including entrance ramp in that section) for various tasks including excavation, paving and retaining wall work. Tuesday, April 23 until Thursday, April 25. Nightly 9 p.m. until 5 a.m. Southbound-to-northbound turnaround at FM 218 (Pat Booker Road) for drill shaft work. Monday, April 22 until Monday, April 29. Nightly 9 p m. until 5 a.m. Alternating frontage road lanes in both directions for pavement marking and striping work. Friday, April 26 until Saturday, April 27. Midnight to 12 p.m. Full frontage road closure in both directions at SH 16 (Bandera Road) for traffic signal work. Saturday, April 27 until Monday, April 29. Midnight to 5 a.m. Alternating frontage road lanes in both directions for traffic signal work. Monday, April 22 until Friday, April 26. Daily 9 a.m. until 5 p.m. Northbound right frontage road lane from FM 1957 (Potranco Road) to SH 151 for sidewalk work. Monday, April 22 until Friday, April 26. Daily 9 a.m. to 3 p.m. Alternating lanes at FM 1957 (Potranco Road), Military Drive and Wiseman Boulevard will be closed for sign work. Monday, April 22 until Saturday, April 27. Nightly 7 p.m. to 6 a.m. Alternating southbound frontage lanes between SH 151 and FM 1957 (Potranco Road) for paving and final surface work. Monday, April 22 until Saturday, April 27. Nightly 9 p.m. to 5 a.m. Alternating northbound frontage lanes between FM 1597 (Potranco Road) and SH 151 for traffic switch over to new lane configuration and setting concrete traffic barriers. Monday, April 22 until Saturday, April 27. Nightly 9 p.m. to 6 a.m. The right lane on northbound Loop 1604 at Marbach Road for overhead structure work. Monday, April 22 until Thursday, April 25. Nightly 9 p.m. until 6 a.m. Southbound right lane on before Potranco Road to south of Medio Creek for overhead structure work. Monday, April 22 until Thursday, April 25. Daily 9 a.m. to 4 p.m. The intersection of Loop 1604 at South Flores for storm drain installation work. Only one side of the intersection will be worked on at a time. Monday, April 22 until Thursday, April 25. Daily 9 a.m. to 4 p.m. The intersection of Loop 1604 at Priest Road for storm drain installation work. Only one side of the intersection will be worked on at a time. Monday, April 22 until Friday, April 26. Nightly 9 p.m. until 5 a.m. Left mainlane in both directions from SH 46 to US 87 for center median paving work. Sunday, April 28 until Tuesday, May 14. Full-time closure of westbound Exit 550/Ralph Fair Road exit ramp for lengthening and widening work to fit the expanded mainlane configuration. Monday, April 29 until Monday, May 13. Full-time closure of eastbound Exit 552/Dominion Drive exit ramp for lengthening and widening work to fit the expanded mainlane configuration. Current until further notice. Eastbound entrance ramp from FM 1516. DETOUR: Take next entrance ramp east of Loop 1604. Monday, April 22 until Friday, April 26. Daily 9 a.m. until 3:30 p.m. Left westbound frontage road lane from Dietrich Road to Ackerman Road for storm drain installation. Monday, April 22 until Friday, April 26. Daily 9 a.m. until 3:30 p.m. Left westbound mainlane from FM 1516 to Martinez Creek for construction truck access. Monday, April 22 until Friday, April 26. Daily 9 a.m. until 3:30 p.m. Eastbound-to-westbound turnaround at FM 1516 for overpass construction. Monday, April 22 until Friday, April 26. Nightly 7 p.m. until 5 a.m. Left westbound mainlane from FM 1516 to Martinez Creek and from Woodlake Parkway to Rosillo Creek for construction truck access. Monday, April 22 until Friday, April 26. Nightly 9 p.m. until 5 a.m. Left eastbound mainlane from Rosillo Creek to Woodlake Parkway and from Martinez Creek to FM 1516 for construction truck access. Wednesday, April 24 until Friday, April 26. Nightly 8 p.m. until 5 a.m. The northbound I-410 frontage road from Bronco Lane to Marbach Road will be closed to remove low profile concrete barrier restripe the frontage road. DETOUR: Traffic will be detoured to the on-ramp before Marbach Road, continue on northbound I-410 and exit at SH 151 to get on I-410 northbound frontage road. Monday, April 22 until Friday, April 26. Daily 9 a.m. to 3 p.m. Alternating frontage roads lanes in both directions between I-410 to Westover Hills will be closed to install concrete mow strip. Monday, April 22 until Friday, April 26. Daily 9 a.m. until 3 p.m. Alternating eastbound frontage road lanes from Old Highway 90 to Westover Hills for metal beam guard rail installation work. Tuesday, April 23 until Friday, April 26. Nightly 9 p.m. until 5 a.m. Alternating westbound frontage road lanes from I-410 to Military Drive will be closed for mill and overlay work. Various ramps will be closed as necessary. City of San Antonio closure for Hardberger Park Landbridge project. Monday, April 22 until Friday, April 26. Daily 9 a.m. until 4 p.m. Right lane in both directions from FM 1535 (NW Military Hwy.) to FM 2696 (Blanco Road) for construction truck and equipment access. City of San Antonio closure for Hardberger Park Landbridge project. Saturday, April 27. 7 a.m. until 5 p.m. Right lane in both directions from FM 1535 (NW Military Hwy.) to FM 2696 (Blanco Road) for construction truck and equipment access. Monday, April 22 until Friday, April 26. Nightly 9 p.m. until 5 a.m. Alternating mainlanes in both directions between Quincy Lee Drive and Legends Trail for pavement marking and striping work. Friday, April 26 until Saturday, April 27. Midnight until noon. Full closure in both directions at Loop 1604. DETOURS: Southbound traffic diverted to Loop 1604 westbound frontage road, take the turnaround at Braun Road and right turn back to southbound SH 16; northbound traffic diverted to Loop 1604 frontage road, take the turnaround at FM 1560 (Hausman Road) and then right turn back to northbound SH 16. Saturday, April 27 until Monday, April 29. Midnight until 5 a.m. Alternating lanes in both directions from Quincy Lee to Legends Trail for traffic signal work. Monday, April 22. 9:30 a.m. until 3 p.m. Full mainlane closure at FM 471 (Exits 127-129) for DPS assistance work. DETOUR: Traffic diverted to frontage road at Exit 127, reentering mainlanes at next entrance ramp after FM 471 intersection. Current until Tuesday, April 30. Full time closure. Alternating lanes in both directions from FM 1332 to Atascosa/McMullen county line for milling and inlay, bridge rail and guard rail work. Monday, April 22 until Friday, April 26. Daily 8 a.m. until 5 p.m. Alternating southbound lanes from Tilden to FM 1962 for paving work. Monday, April 22 until Friday, April 26. Daily 9 a.m. until 3 p.m. Left lane in both directions at FM 1937 for barrier and asphalt work. Current until further notice. Daily 7 a.m. until 7 p.m. Alternating southbound lanes from Woodlake Parkway until Gibbs Sprawl Road for barrier work (existing seven total lanes narrowed to three, with one in each direction and a two-way turn lane in the middle). Current until 4 p.m. Saturday, April 20. Daily 9 a.m. until 4 p.m. Southbound right lane from to E. Houston Street to Rice Road for sidewalk and driveway work. Current until 4 p.m. Saturday, April 20. Daily 9 a.m. until 4 p.m. Northbound right lane from Elmi Road to Springfield Road for sidewalk and driveway work. Current until 4 p.m. Saturday, April 20. Daily 9 a.m. until 4 p.m. Westbound right lane from WW White to Covington Road for sidewalk and driveway work. Current until further notice. 9 p.m. until 5 a.m. Eastbound left lane from East Sharon Drive to Charger Boulevard for traffic switch (drivers diverted to the right side for construction access on the right side; left turn lane remains open). Wednesday, April 24 until Wednesday, April 25. 9 p.m. until 5 a.m. Right lane in both directions at Charger Boulevard for striping work. Current until Friday, May 31. Daily 7 a.m. until 8 p.m. Both directions closed between SH 16 to La Parita Creek for drainage work. Current until 3 p.m. Saturday, April 20. Daily 9 a.m. until 3 p.m. Southbound right lane of San Pedro Avenue from Loop 410 to West Rector Avenue for sidewalk and driveway work. Monday, April 29 until Tuesday, April 30. 9 p.m. until 5 a.m. All lanes of Borgfeld Avenue in both directions from Bulverde Road to US 281 for striping work. Tuesday, April 30 until Wednesday, May 1. 9 p.m. until 5 a.m. All lanes of Borgfeld Avenue in both directions from Bulverde to US 281 for barrier setting work. Sunday, April 14. Midnight until noon. Full westbound frontage road closure from Gold Canyon Drive to the US 281 northbound frontage road for beam work. DETOUR: Take the double left at Gold Canyon Drive, take the double left at Redland Road, use the Redland Road entrance ramp, take the Stone Oak Parkway exit ramp, use the turnaround at Stone Oak Parkway. Monday, April 15 until Friday, April 18. Nightly 9 p.m. until 5 a.m. Eastbound left frontage road lane from Redland Road and Bulverde Road (including entrance ramps) for various tasks including excavation, paving and restriping. Monday, April 15 until Thursday, April 18. Daily 8 a.m. until 4 p.m. Eastbound left frontage road lane from Redland Road and Bulverde Road (including entrance ramps) for various tasks including excavation, paving and restriping. Monday, April 15 until Thursday, April 18. Nightly 9 p.m. until 5 a.m. Eastbound right mainlane between Redland Road and Bulverde Road for retaining wall work. Monday, April 15 until Thursday, April 18. Nightly 9 p.m. until 5 a.m. Eastbound left lane closure from the US 281 northbound exit ramp to the Gold Canyon Road exit ramp for steel girder installation work. Monday, April 15 until Thursday, April 18. Nightly 9 p.m. until 5 a.m. Full eastbound mainlane closure from the US 281 northbound exit ramp to the US 281 entrance ramp for steel girder installation work. DETOUR: Use the US 281 northbound exit ramp, pass through the US 281 intersections, use the US 281 entrance ramp. Monday, April 15 until Thursday, April 18. Nightly 9 p.m. until 5 a.m. Left and center lane closure of the westbound frontage road from the US 281 northbound exit ramp to the US 281 northbound frontage road, including the US 281 northbound exit ramp, for steel girder installation work. Tuesday, April 16. 9 a.m. until 4 p.m. Various locations in both directions at intersection with Bulverde Road for traffic signal work. Current until 9 p.m. Wednesday, April 17. Turnarounds in both directions at FM 218 (Pat Booker Road) for drill shaft work. Monday, April 15 until Friday, April 19. Nightly 9 p.m. until 5 a.m. Southbound left mainlane from SH 218 (Pat Booker Road) to Kitty Hawk for barrier pinning work. Sunday, April 14 until Thursday, April 18. Nightly 9 p.m. until 5 a.m. One eastbound frontage road lane from La Cantera/Peace Boulevard to Vance Jackson Road for milling and paving work. Sunday, April 14 until Thursday, April 18. Nightly 9 p.m. until 5 a.m. One mainlane in both directions from Bandera Road to Roger’s Ranch Road for bridge joint sealing work. Sunday, April 14 until Thursday, April 18. Nightly 9 p.m. until 5 a.m. Eastbound and westbound cloverleaf ramps to I-10 for milling and paving work. Monday, April 15 until Wednesday, April 17. Daily 9 a.m. until 3 p.m. One westbound frontage road lane from Vance Jackson Road to I-10 for mow strip work. Monday, April 15 until Friday, April 19. Nightly 9 p.m. until 5 a.m. Alternating westbound mainlanes from Security Service Credit Union to Taco Cabana for barrier removal work. Monday, April 15 until Friday, April 19. Nightly 9 p.m. until 5 a.m. Alternating eastbound mainlanes from Chili’s to HEB driveway for barrier removal work. Monday, April 15 until Wednesday, April 17. Daily 9 a.m. until 3 p.m. One eastbound frontage road lane from NW Military Highway to Roger’s Ranch Road for mow strip work. Tuesday, April 16 until Wednesday, April 17. 9 p.m. until 5 a.m. Full eastbound mainlane closure at Bitters Road (including entrance ramp before Bitters) for overhang work on Bitters overpass. Wednesday, April 17 until Thursday, April 18. 9 p.m. until 5 a.m. Full eastbound mainlane closure from NW Military Highway to Blanco Road (including NW Military and Bitters entrance ramps) for overhang placement work at the new Huebner Road turnaround bridge. Thursday, April 18 until Friday, April 19. 9 p.m. until 5 a.m. Full westbound mainlane closure from Blanco Road to Bitters Road (including Blanco, Stone Oak and US 281 entrance ramps) for overhang placement work at the new Huebner Road turnaround bridge. Monday, April 15 until Thursday, April 18. Daily 9 a.m. until 3 p.m. Alternating southbound mainlanes from Dove Canyon to US 90 for sidewalk, curb, mow strip and rip rap work. Monday, April 15 until Friday, April 19. Daily 9 a.m. until 3 p.m. Alternating northbound frontage road lanes from FM 1957 (Potranco Road) to SH 151 for setting barrier and sidewalk work. Monday, April 15 until Friday, April 19. Daily 9 a.m. until 3 p.m. Southbound left frontage road lane from FM 1957 (Potranco Road) to SH 151 for exit/entrance ramp paving work. Monday, April 15 until Friday, April 19. Daily 9 a.m. until 3 p.m. Alternating frontage road lanes in both directions at Potranco Road, Military Drive and Wiseman Boulevard for sign installation work. Monday, April 15 until Saturday, April 20. Nightly 9 p.m. until 5 a.m. Alternating northbound frontage road lanes from FM 1957 (Potranco Road) to SH 151 for setting barrier for traffic switch. Tuesday, April 16 until Friday, April 19. Nightly 9 p.m. until 5 a.m. Full southbound mainlane closure from Alamo Ranch Parkway to Wiseman Boulevard for restriping and pavement marker installation work. Sunday, April 14. Midnight until noon. Right lane closure from the Loop 1604 eastbound frontage road to the Loop 1604 westbound frontage road for beam work. Sunday, April 14. Midnight until noon. Full northbound mainlane closure from the Frontage Road exit ramp to the Sonterra Boulevard exit ramp for beam work. DETOUR: take the Frontage Road exit ramp, continue through the intersections at Loop 1604 and take the Sonterra Boulevard entrance ramp. Monday, April 15 until Wednesday, April 17. Nightly 9 p.m. until 5 a.m. Full southbound frontage road closure from the Sonterra Boulevard exit ramp to the Loop 1604 westbound frontage road for bridge work. DETOUR: Sonterra Boulevard traffic; Go north on US 281, take the turnaround south of Encino Rio and stay on southbound US 281. Southbound US 281 traffic; stay on southbound US 281, take the Donella Drive exit ramp, use the turnaround at Donella Drive and stay on the US 281 northbound frontage road. Monday, April 15 until Thursday, April 18. Nightly 9 p.m. until 5 a.m. Alternating mainlanes in both directions from Loop 1604 to Marshall Road for striping..
Current until 4 p.m. Saturday, April 13. Right mainlane in both directions between FM 3351 (Ralph Fair Road) and Fair Oaks Parkway for ramp work. Current until Thursday, April 18. Daily 9 a.m. until 3 p.m. Westbound left mainlane at Dominion Drive and entrance ramp for retaining wall work. Current until Thursday, April 18. Daily 9 a.m. until 3 p.m. Eastbound left frontage road lane at Boerne Stage Road for traffic rail foundation work. Sunday, April 14 until Friday, April 19. Nightly 9 p.m. until 5 a.m. Left mainlane in both directions from SH 46 to US 87 for center median paving work. Wednesday, April 17 until Thursday, April 18. Nightly 9 p.m. until 5 a.m. Southbound left mainlane from just north of Overlook Parkway to just south of Overlook Parkway for barrier work. Sunday, April 14. 6 a.m. until 3 p.m. 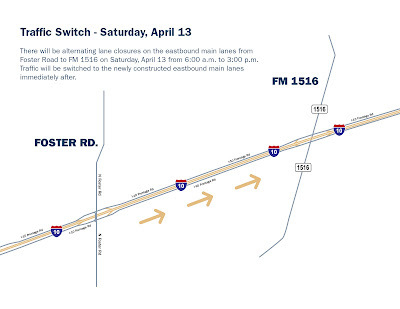 Alternating eastbound mainlanes from Foster Road to FM 1516. Eastbound traffic will then be shifted to the new permanent mainlanes on the new Woodlake Parkway overpass. Sunday, April 14 until Friday, April 19. Nightly 7 p.m. until 5 a.m. Left westbound mainlane from FM 1516 to Martinez Creek and from Woodlake Parkway to Rosillo Creek for construction truck access and barrier work. Sunday, April 14 until Friday, April 19. Nightly 9 p.m. until 5 a.m. Left eastbound mainlane from Rosillo Creek to Woodlake Parkway and from Martinez Creek to FM 1516 for construction truck access. Monday, April 15 until Thursday, April 18. Daily 9 a.m. until 3:30 p.m. Left westbound frontage road lane from Dietrich Road to Ackerman Road for box culvert installation. Monday, April 15 until Thursday, April 18. Daily 9 a.m. until 3:30 p.m. Left westbound mainlane from FM 1516 to Martinez Creek for construction truck access. Monday, April 15 until Thursday, April 18. Daily 9 a.m. until 3:30 p.m. Eastbound-to-westbound turnaround at FM 1516 for overpass construction. Monday, April 15 until Thursday, April 18. Daily 7:30 a.m. until 7 p.m. Alternating eastbound mainlanes between SH 130 and US 183 for milling and inlay work. Saturday, April 13. Midnight until 8 a.m. Full northbound mainlane closure at North New Braunfels Avenue for bridge overhang bracket removal work. Current until 5 a.m. Saturday, April 13. Frontage roads (one lane remains open) in both directions at Marbach Road (including intersection) for overhang removal work. Saturday, April 13. 6 a.m. until 12 p.m. Left mainlane in both directions (from US 90 to Marbach Road northbound & from US 90 to Valley Hi southbound) for lighting work. Sunday, April 14 until Monday, April 15. 8 p.m. until 5 a.m. Left mainlane in both directions (from US 90 to Marbach Road northbound & from US 90 to Valley Hi southbound) for lighting work. Wednesday, April 17 until Saturday, April 20. Nightly 8 p.m. until 5 a.m. Full northbound frontage road closure from Marbach Road to SH 151 for milling and overlay work. Sunday, April 14 until Friday, April 19. Nightly 8 p.m. until 5 a.m. Southbound left frontage road lane from Bertetti Drive to US 90 for direct connector work. Monday, April 15 until Friday, April 19. Daily 9 a.m. until 3 p.m. Southbound left frontage road lane from Demya Drive to Bertetti Drive for truck access. Monday, April 15 until Friday, April 19. Daily 9 a.m. until 3 p.m. Northbound left frontage road lane from Landing Avenue to Airlift Avenue for truck access. Current until Saturday, April 13. Nightly 9 p.m. until 5 a.m. Full eastbound mainlane closure from ½-mile west of Loop 1604 to ½-mile east of Loop 1604 for barrier removal work. Monday, April 15 until Thursday, April 18. Nightly 9 p.m. until 5 a.m. Full westbound mainlane closure from ¼-mile east of Loop 1604 to ¼-mile west of Loop 1604 for various tasks including light pole installation work. Sunday, April 14 until Friday, April 19. Nightly 8 p.m. until 5 a.m. Full eastbound mainlane closure at the eastbound-northbound connector to I-410 for direct connector work. Sunday, April 14 until Monday, April 15. 8 p.m. until 5 a.m. Full westbound mainline closure from Colt Drive to I-410 and eastbound left mainlane from Carlitos Way to I-410 for light pole removal work. Monday, April 15 until Friday, April 19. Nightly 8 p.m. until 5 a.m. Full eastbound mainlane closure from Loop 1604 to I-410 (including Ray Ellison exit) for asphalt work. Monday, April 15 until Thursday, April 18. Daily 9 a.m. to 3 p.m. Westbound-to-eastbound turnaround at I-410 for bridge work and overhang removal work. Monday, April 15 until Friday, April 19 Daily 9 a.m. until 3 p.m. Alternating eastbound frontage road lanes from Old Highway 90 to Westover Hills for guard rail installation work. Monday, April 15 until Friday, April 19. Daily 9 a.m. until 4 p.m. Alternating westbound frontage road lanes from Old Highway 90 to I-410 for mow strip work. Monday, April 15 until Friday, April 19. Daily 9 a.m. until 4 p.m. Alternating westbound frontage road lanes from I-410 to Military Drive for mow strip work. City of San Antonio closure for Hardberger Park Landbridge project. Monday, April 15 until Friday, April 19. Daily 9 a.m. until 4 p.m. Right lane in both directions from FM 1535 (NW Military Hwy.) to FM 2696 (Blanco Road) for construction truck and equipment access. City of San Antonio closure for Hardberger Park Landbridge project. Saturday, April 20. 7 a.m. until 5 p.m. Right lane in both directions from FM 1535 (NW Military Hwy.) to FM 2696 (Blanco Road) for construction truck and equipment access. Monday, April 15 until Friday, April 19. Nightly 9 p.m. until 5 a.m. Alternating lanes in both directions between Quincy Lee Drive and Legends Trail for barrier removal and lane striping work. Monday, April 15 until Friday, April 19. Daily 8 a.m. until 5 p.m. Alternating southbound lanes from Tilden to FM 1962 (mile markers 680 to 690) for paving work. Monday, April 15 until Saturday, April 20. Daily 9 a.m. until 4 p.m. Southbound right lane from to E. Houston Street to Rice Road for sidewalk and driveway work. Monday, April 15 until Saturday, April 20. Daily 9 a.m. until 4 p.m. Northbound right lane from Elmi Road to Springfield Road for sidewalk and driveway work. Current Saturday, April 13. Daily 9 a.m. until 4 p.m. Two southbound lanes from I-10 to Rigsby Avenue for utility and drainage work. Monday, April 15 until Saturday, April 20. Daily 9 a.m. until 4 p.m. Westbound right lane from WW White to Covington Road for sidewalk and driveway work. Saturday, April 13 until Monday, April 15. 9 p.m. until 5 a.m. Alternating lanes of eastbound and westbound Evans Road, east of US 281 for striping work. Monday, April 15 until Saturday, April 20. Daily 9 a.m. until 3 p.m. Southbound right lane of San Pedro Avenue from Loop 410 to West Rector Avenue for sidewalk and driveway work. Monday, April 15 until Thursday, April 18. Nightly 9 p.m. until 5 a.m. Left lane of eastbound and westbound Stone Oak Parkway, west of US 281 for barrier setup. Monday, April 15 until Thursday, April 18. Nightly 9 p.m. until 5 a.m. Alternating lanes of eastbound and westbound Evans Road, at US 281 for striping. As we've previously described in detail in our blog, there's quite a bit of construction activity taking place on I-10 in Far East San Antonio (two projects), part of a larger effort to improve and enhance I-10 out further to Guadalupe County and eventually all the way to Houston. One of those two ongoing projects started in Fall 2016 and is expected to wrap by the end of this year. Improvements include: New bridge at Woodlake Parkway, intersection upgrades, new signals, reconfiguration of entrance/exit ramps and conversion of the frontage roads from two-way to one-way traffic. Now that project is hitting an important milestone. 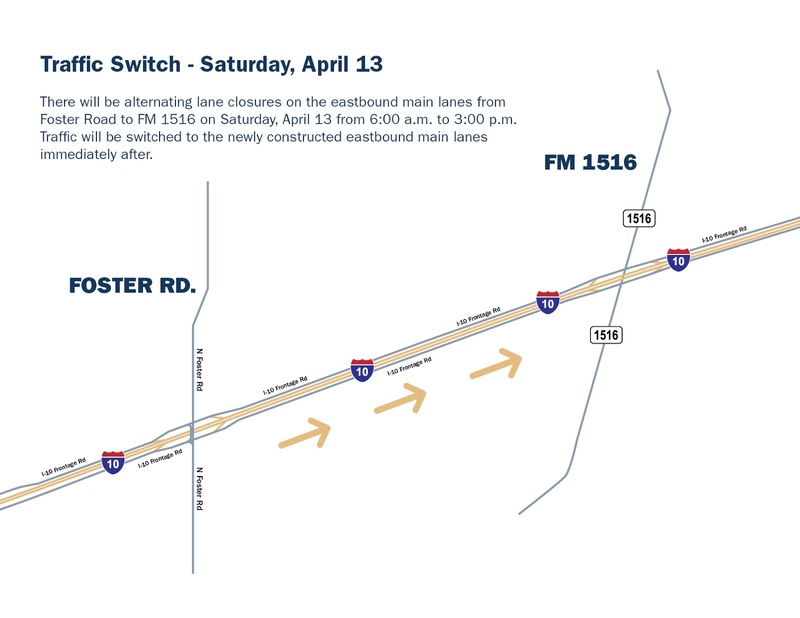 This Saturday, April 13, our contractor Texas Sterling Construction will switch I-10 eastbound traffic to the new mainlanes between Foster Road and FM 1516 (see map). Before the switch happens, there will be alternating lane closures from 6 a.m. to 3 p.m that day. Traffic will be switched to the newly constructed main lanes immediately upon completion of work in the afternoon. Please note that the switch taking effect means detours currently in place will be removed to allow drivers to transition onto the new mainlanes (which feature 12-foot lanes and 10-foot shoulders) in the afternoon. The newly constructed lanes enhance safety by giving drives improved sight distance and an increased clear zone to roadside obstacles such as signs and overhead sign bridge structures. You might be asking: What about the westbound mainlanes? A traffic switch for the westbound mainlanes is scheduled for later this month, essentially repeating this process only that it will take place on the other side of the highway. Tomorrow (Tuesday, April 9) morning after rush hour, crews will open the new two southbound lanes on Loop 337 to drivers for roughly a one-mile stretch running from River Road to SH 46. 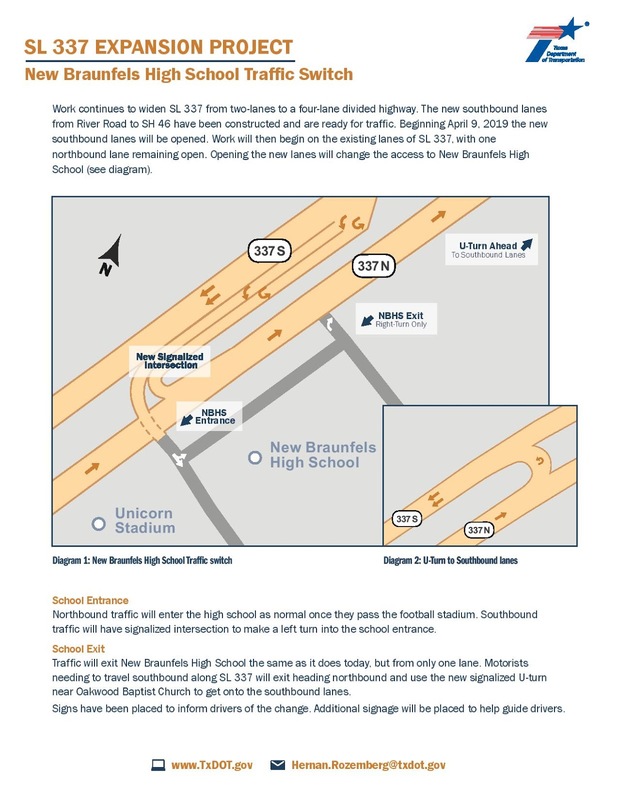 Once these have opened for this long-term traffic switch, crews will begin work on the existing lanes, with one northbound lane remaining open to traffic (see maps below for to get a better visual sense). To access New Braunfels High School, southbound traffic will have a signalized intersection to make a left turn into the school entrance. All traffic exiting New Braunfels High School must turn right onto northbound Loop 337. 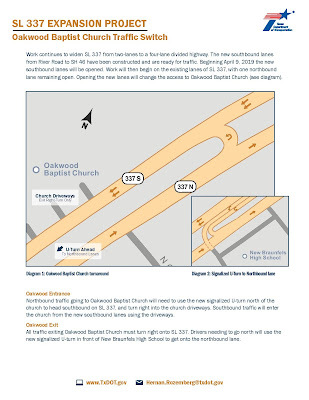 To head southbound, drivers will use the new signalized U-turn near Oakwood Baptist Church. 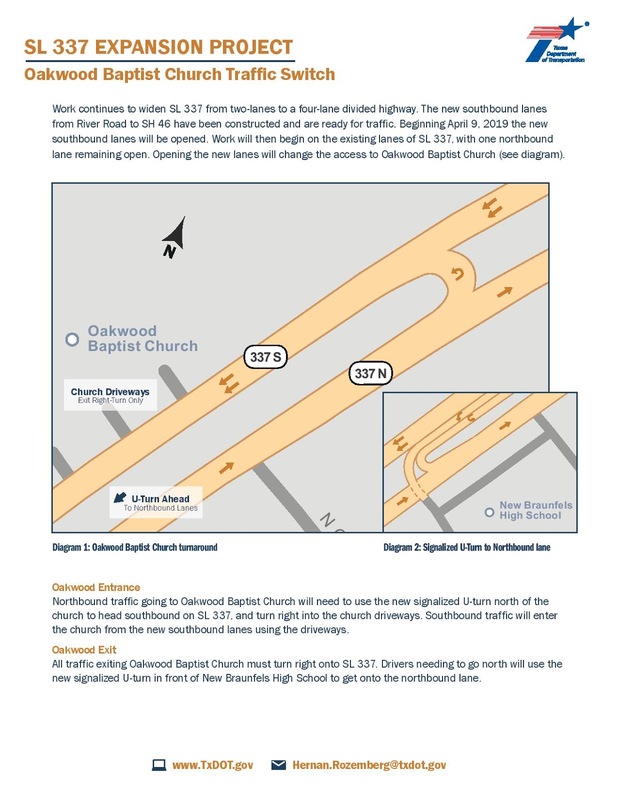 To access Oakwood Baptist Church, northbound traffic will use a new signalized U-turn north of the church to head southbound on Loop 337. All traffic exiting Oakwood Baptist Church must turn right onto southbound Loop 337. 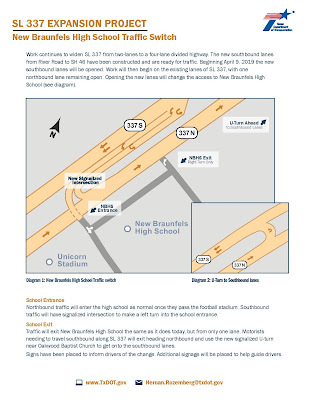 To head northbound, drivers will use the new signalized U-turn near New Braunfels High School. Road signs have been placed to direct drivers through the new roadway configuration. We ask the traveling public to adhere to construction signage and remain aware when traveling through the work zone. As always, weather may impact the timing of these closures. We appreciate your patience and understanding as crews work to improve safety and mobility in the area. Construction for the Loop 337 Expansion project began in November 2017 and is anticipated to be completed in late 2021. The construction project is about six miles long, from I-35 to Hillcrest Drive, and includes an upgrade to a 4-lane divided roadway with pedestrian accommodations and new bridges in various locations. Sunday, April 7 until Friday, April 12. Nightly 9 p.m. until 5 a.m. Eastbound left frontage road lane from Redland Road and Bulverde Road (including entrance ramps) for various tasks including excavation, paving and restriping. Monday, April 8 until Friday, April 12. Nightly 9 p.m. until 5 a.m. Full closure of the westbound to eastbound turnaround at US 281 to install bridge bents. DETOUR: Take left at the US 281 southbound frontage road and a left at the Loop 1604 eastbound frontage road. Sunday, April 7 until Monday, April 8. 9 p.m. until 5 a.m. Northbound left mainlane from Kitty Hawk to SH 218 (Pat Booker Road) for barrier pinning work. Monday, April 8 until Friday, April 12. Nightly 9 p.m. until 5 a.m. Southbound left mainlane from SH 218 (Pat Booker Road) to Kitty Hawk for barrier pinning work. Sunday, April 7 until Friday, April 12. Nightly 9 p.m. until 5 a.m. One eastbound frontage road lane from La Cantera/Peace Boulevard to Vance Jackson Road for milling and paving work. Sunday, April 7 until Friday, April 12. Nightly 9 p.m. until 5 a.m. One mainllane in both directions from Bandera Road to Roger’s Ranch Road for bridge joint sealing work. Sunday, April 7 until Friday, April 12. Nightly 9 p.m. until 5 a.m. Eastbound and westbound cloverleaf ramps to I-10 for milling and paving work. Monday, April 8 until Friday, April 12. Daily 9 a.m. until 3 p.m. One westbound frontage road lane from Vance Jackson Road to I-10 for mow strip work. Monday, April 8 until Friday, April 12. Nightly 9 p.m. until 5 a.m. Alternating westbound mainlanes from Security Service Credit Union to Taco Cabana for barrier removal work. Monday, April 8 until Friday, April 12. Nightly 9 p.m. until 5 a.m. Alternating eastbound mainlanes from Chili’s to HEB driveway for barrier removal work. Thursday, April 11 until Friday, April 12. 9 p.m. until 5 a.m. Full eastbound mainlane closure from NW Military Highway to Blanco Road (including NW Military and Bitters entrance ramps) for new Huebner Road turnaround bridge work. Thursday, April 11 until Friday, April 12. 9 p.m. until 5 a.m. Full westbound mainlane closure from Blanco Road to Bitters Road (including Blanco, Stone Oak and US 281 entrance ramps) for new Huebner Road turnaround bridge work. Wednesday, April 17 until Thursday, April 18. 9 p.m. until 5 a.m. Full eastbound mainlane closure from NW Military Highway to Blanco Road Iincluding NW Military and Bitters entrance ramps) for overhang placement work at the new Huebner Road turnaround bridge. Wednesday, April 17 until Thursday, April 18. 9 p.m. until 5 a.m. Full westbound mainlane closure from Blanco Road to Bitters Road (including Blanco, Stone Oak and US 281 entrance ramps) for overhang placement work at the new Huebner Road turnaround bridge. Current until 6 a.m. Saturday, April 6. Northbound left mainlane from Big Mesa to Marbach Road for Overhead Sign Bridge (OSB) work. Current until 3 p.m.Saturday, April 6. Daily 9 a.m. until 3 p.m. Northbound left frontage road lane from FM 1957 (Potranco Road) to Wiseman Boulevard for resetting barrier work. Monday, April 8 until Saturday, April 13. Daily 9 a.m. until 3 p.m. Alternating northbound mainlanes from Big Mesa to Medio Creek for sidewalk, curb, mow strip and rip rap work. Monday, April 8 until Saturday, April 13. Daily 9 a.m. until 3 p.m. Alternating southbound mainlanes from Dove Canyon to US 90 for sidewalk, curb, mow strip and rip rap work. Monday, April 8 until Saturday, April 13. Nightly 9 p.m. until 6 a.m. Northbound right mainlane at Marbach Road for Overhead Sign Bridge (OSB) work. Monday, April 8 until Tuesday, April 9. 9 p.m. until 5 a.m. Alternating northbound frontage road lanes from FM 1957 (Potranco Road) to Military Drive for traffic switch preparation work. Monday, April 8 until Friday, April 12. Daily 9 a.m. until 3 p.m. Northbound right frontage road lane from FM 1957 (Potranco Road) to SH 151 for sidewalk work. Monday, April 8 until Friday, April 12. Daily 9 a.m. until 3 p.m. Southbound left frontage road lane from FM 1957 (Potranco Road) to SH 151 for exit/entrance ramp paving work. Tuesday, April 9 until Saturday, April 13. Nightly 9 p.m. until 5 a.m. Left frontage road lane in both directions from Wiseman Boulevard to Military Drive for barrier work. Monday, April 8 until Friday, April 12. Nightly 9 p.m. until 5 a.m. Full northbound mainlane closure from the Frontage Road exit ramp to the Sonterra Boulevard entrance ramp to install steel girders. DETOUR: take the Frontage Road exit ramp, take a right on the Loop 1604 westbound frontage road. If going north; use the turnaround at Gold Canyon Road and take a right on the northbound frontage road. If heading west; drive along the eastbound Loop 1604 frontage road through the Gold Canyon Road intersection, use the turnaround at Redland Road, take the Redland Road entrance ramp and use the Stone Oak Parkway exit ramp. Monday, April 8 until Friday, April 12. Nightly 9 p.m. until 5 a.m. Full southbound frontage road closure from Loop 1604 eastbound frontage road to Loop 1604 westbound frontage road, including the westbound to eastbound turnaround at US 281 for beam work. DETOUR: take a right on the Loop 1604 eastbound frontage road, if going north; use the turnaround at Gold Canyon Road and take a right on the northbound US 281 frontage road. Monday, April 8 until Friday, April 12. Nightly 9 p.m. until 5 a.m. Full southbound mainlane closure from the Sonterra Boulevard exit ramp to the Donella Drive entrance ramp to install steel girders. DETOUR: take the Sonterra Boulevard exit ramp, drive along the southbound frontage road through the Loop 1604 and Donella Drive intersections and use the Donella Drive entrance ramp. Monday, April 8 until Friday, April 12. Nightly 9 p.m. until 5 a.m. Full southbound frontage road closure from the Sonterra Boulevard exit ramp to the Loop 1604 westbound frontage road to install bridge overhangs. DETOUR: Sonterra Boulevard traffic; go north on US 281, take the turnaround south of Encino Rio and stay on southbound US 281. Southbound US 281 traffic; stay on southbound US 281, take the Donella Drive exit ramp, use the turnaround at Donella Drive and stay on the US 281 northbound frontage road. Monday, April 8 until Tuesday, April 9. 9 p.m. until 5 a.m. Southbound right lane from Cibolo Creek bridge to Borgfeld Avenue to barrier setting work. Tuesday, April 9 until Wednesday, April 10. 9 p.m. until 5 a.m. Southbound left lane from Borgfeld Avenue to Overlook Parkway for barrier setting work. Wednesday, April 10 until Thursday, April 11. 9 p.m. until 5 a.m. Southbound left lane from Overlook Parkway to Summer Glenn for barrier setting work. Thursday, April 11 until Friday, April 12. 9 p.m. until 5 a.m. Southbound left lane from Overlook Parkway to Summer Glenn for barrier setting work. Thursday, April 11 until Friday, April 12. Nightly 9 p.m. until 5 a.m. Alternating lanes in both directions at Evans Road for striping work. Saturday, April 13 until Monday, April 15. Full weekend closure from 9 p.m. until 5 a.m. Full northbound mainlane closure from the Frontage Road exit ramp to the Sonterra Boulevard entrance ramp to install steel girders. DETOUR: take the Frontage Road exit ramp, take a right on the Loop 1604 westbound frontage road. If going north; use the turnaround at Gold Canyon Road and take a right on the northbound frontage road. If heading west; drive along the eastbound Loop 1604 frontage road through the Gold Canyon Road intersection, use the turnaround at Redland Road, take the Redland Road entrance ramp and use the Stone Oak Parkway exit ramp. Saturday, April 13 until Monday, April 15. Full weekend closure from 9 p.m. until 5 a.m. Full southbound frontage road closure from the Loop 1604 eastbound frontage road to Loop 1604 westbound frontage road, including the westbound to eastbound turnaround at US 281 to erect concrete beams. DETOUR: take a right on the Loop 1604 eastbound frontage road, if going north; use the turnaround at Gold Canyon Road and take a right on the northbound US 281 frontage road. Saturday, April 13 until Monday, April 15. Weekend alternating closure from 9 p.m. until 5 a.m. Alternating lanes in both directions at Evans Road will be closed for striping work. Saturday, April 13 until Monday, April 15. Full weekend closure from 9 p.m. until 5 a.m. Full southbound mainlane closure from the Sonterra Boulevard exit ramp to the Donella Drive entrance ramp to install steel girders. DETOUR: take the Sonterra Boulevard exit ramp, drive along the southbound frontage road through the Loop 1604 and Donella Drive intersections and use the Donella Drive entrance ramp. Saturday, April 13 until Monday, April 15. 9 p.m. until 5 a.m. Alternating lanes at Evans Road for striping work. Monday, April 8 until Friday, April 12. Daily 9 a.m. until 3 p.m. Left lane in both directions at FM 1937 (South Flores Road) pavement marking and barrier work. Current until 3 p.m. Saturday, April 6. Eastbound left frontage road lane at Dominion Drive for drilling work. Current until 4 p.m. Saturday, April 6. Right mainlane in both directions from FM 3351 (Ralph Fair Road) to Fair Oaks Parkway (including exit and entrance ramps) for pavement work. Monday, April 8. 9 a.m. until 4 p.m. Westbound right mainlane between FM 3351 (Ralph Fair Road) and Fair Oaks Parkway (including Exit 546 ramp) for seal and paving work. Tuesday, April 9. 9 a.m. until 4 p.m. Eastbound right mainlane between FM 3351 (Ralph Fair Road) and Fair Oaks Parkway (including Exit 550 ramp) for seal and paving work. Wednesday, April 10 until Saturday, April 13. Daily 9 a.m. until 4 p.m. Right mainlane in both directions between FM 3351 (Ralph Fair Road) and Fair Oaks Parkway for ramp work. Sunday, April 7 until Friday, April 12. Nightly 7 p.m. until 5 a.m. Left westbound mainlane from FM 1516 to Martinez Creek and from Woodlake Parkway to Rosillo Creek for construction truck access and installation of portable barriers. Sunday, April 7 until Friday, April 12. Nightly 9 p.m. until 5 a.m. Left eastbound mainlane from Rosillo Creek to Woodlake Parkway and from Martinez Creek to FM 1516 for construction truck access and installation of portable barriers. Monday, April 8. 9 a.m. until 3 p.m. Eastbound-to-westbound turnaround at Foster Road. DETOUR: Traffic will instead travel through the signalized intersection. Monday, April 8. 9 a.m. until 3 p.m. Right southbound lane of Foster Road at the intersections of the eastbound and westbound frontage roads at I-10. Monday, April 8 until Friday, April 12. Daily 9 a.m. until 3:30 p.m. Left westbound frontage road lane from Dietrich Road to Ackerman Road for box culvert installation. Monday, April 8 until Friday, April 12. Daily 9 a.m. until 3:30 p.m. Left westbound mainlane from FM 1516 to Martinez Creek for construction truck access. Monday, April 8 until Saturday, April 13. Daily 9 a.m. until 3:30 p.m. Eastbound-to-westbound turnaround at FM 1516 for overpass construction. Police officers will direct traffic through the intersection when the turnaround is closed. Tuesday, April 9, 4 a.m. until Wednesday, April 10, 5 a.m. Westbound frontage road from Loop 1604 to FM 1516. DETOUR: Westbound frontage road through-traffic will take Weichold Road to FM 1516, then take FM 1516 south back to I-10. Local frontage road access will be available. Thursday, April 11. 9 a.m. until 3 p.m. Alternating eastbound mainlane closures from Foster Road to FM 1516. Eastbound traffic will then be shifted to the new permanent mainlanes on the new Woodlake Parkway overpass. Thursday, April 11 until Friday, April 12. 7 p.m. until 5 a.m. Full westbound mainlane closure at Ackerman Road (and Ackerman Road under I-10) for overpass construction. WESTBOUND MAINLANE DETOUR: All westbound traffic exits at Ackerman Road, travels through the intersection on the frontage road and re-enters mainlanes past Ackerman Road. ACKERMAN ROAD DETOUR: Northbound traffic on Ackerman Road takes the eastbound frontage road to Foster Road and turns around. Southbound traffic on Ackerman Road takes the westbound frontage road to WW White Road and turns around. Monday, April 8 until Friday, April 12. Daily 7:30 a.m. until 7 p.m. Alternating eastbound lanes from SH 130 to US 183 for milling and inlay and guard rail work. Current until 5 a.m. Friday, April 12. Alternating southbound mainlane and frontage road lanes from US 90 to Valley Hi (mainlanes) & US 90 to Bertetti Drive (frontage road) for direct connector work (mainlanes) and road widening (frontage road) work. Current until 5 a.m. Friday, April 12. Full northbound mainlane closure at US 90 direct connector for overhang and barrier removal work. Sunday, April 7 until Friday, April 12. Nightly 8 p.m. until 5 a.m. Full southbound frontage road closure from the Marbach Road entrance ramp to Marbach Road for drainage work. Monday, April 8 until Thursday, April 11. Daily 8 a.m. until 3 p.m. Northbound left frontage road lane from Westshire Drive to Marbach Road for barrier work. Tuesday, April 9 until Friday, April 12. Daily 8 a.m. until 3 p.m. Southbound left frontage road lane from Zabra Drive to Bertetti Drive for truck access. Thursday, April 11 until Friday, April 12. 9 p.m. until 5 a.m. Eastbound at WW White for light pole installation work. Current until 5 a.m. Tuesday, April 12. Full eastbound mainlane and frontage road closure between Hunt Lane and I-410 (mainlanes) and from Ray Ellison to I-410 (frontage road) for direct connector work. Current until 5 a.m. Tuesday, April 12. Full westbound mainlane closure from I-410 to Hunt Lane for direct connector painting work and overhang removal work. Monday, April 8 until Saturday, April 13 . Nightly 9 p.m. until 5 a.m. Full eastbound mainlane closure from ½-mile west of Loop 1604 to ½-mile east of Loop 1604 for barrier removal work. Monday, April 8 until Saturday, April 12. Nightly 9 p.m. until 5 a.m. Full westbound mainlane closure from ¼-mile east of Loop 1604 to ¼-mile west of Loop 1604 for various tasks including light pole installation work. Sunday, April 7 until Friday, April 12. Nightly 9 p.m. until 5 a.m. Alternating westbound frontage road lanes from I-410 to Military Drive for milling/overlay work. Monday, April 8 until Friday, April 12 Daily 9 a.m. until 4 p.m. Alternating eastbound frontage road lanes from Old Highway 90 to I-410 for guard rail installation work. Monday, April 8 until Friday, April 12 Daily 9 a.m. until 4 p.m. Alternating westbound frontage road lanes from Old Highway 90 to I-410 for mow strip work. Monday, April 8 until Friday, April 12. Daily 9 a.m. until 3 p.m. Alternating westbound frontage road lanes from I-410 to Military Drive for mow strip work. Thursday, April 11 until Friday, April 12. 9 p.m. until 5 a.m. Northbound right mainlane at I-410 for light pole installation work. City of San Antonio closure for Hardberger Park Landbridge project. Monday, April 8 until Friday, April 12. Daily 9 a.m. until 4 p.m. Right lane in both directions from FM 1535 (NW Military Hwy.) to FM 2696 (Blanco Road) for construction truck and equipment access. City of San Antonio closure for Hardberger Park Landbridge project. Saturday, April 13. 7 a.m. until 5 p.m. Right lane in both directions from FM 1535 (NW Military Hwy.) to FM 2696 (Blanco Road) for construction truck and equipment access. Monday, April 8 until Friday, April 12. Nightly 9 p.m. until 5 a.m. Alternating lanes in both directions between Quincy Lee Drive and Legends Trail for barrier removal work. Current until 4 p.m. Monday, April 8. Southbound right lane between Fox Knoll and Toepperwein Road for sidewalk and driveway repair work. Monday, April 8 until Friday, April 12. Daily 9 a.m. until 3 p.m. Alternating lanes in both directions from Goodrich Street until Hamilton Street for raised median installation work. Current until 4 p.m. Saturday, April 6. Daily 9 a.m. until 4 p.m. Right lane in both directions from Rigsby Avenue to Sinclair Road for sidewalk and driveway work. Current until 4 p.m. Saturday, April 6. Daily 9 a.m. until 4 p.m. Northbound right lane from Rice Road to E. Houston Street for sidewalk and driveway work. Current until 4 p.m. Saturday, April 6. Daily 9 a.m. until 4 p.m. Southbound right lane from Hunnicutt Drive to Lord Road for sidewalk and driveway work. Monday, April 8 until Saturday, April 13. Daily 9 a.m. until 4 p.m. Southbound right lane from to E. Houston Street to Rice Road for sidewalk and driveway work. Monday, April 8 until Saturday, April 13. Daily 9 a.m. until 4 p.m. Southbound right lane from Elmi Road to Spring Ield Road for sidewalk and driveway work. Monday, April 8 until Saturday, April 13. Daily 9 a.m. until 4 p.m. Westbound right lane from WW White to Convington Road for sidewalk and driveway work..
Monday, April 8 until Saturday, April 13. Daily 9 a.m. until 4 p.m. Two southbound lanes from I-10 to Rigsby Avenue for utility and drainage work. Current until further notice (estimated 6-8 months). 9 p.m. until 5 a.m. Eastbound left lane from East Sharon Drive to Charger Boulevard for traffic switch (drivers diverted to the right side for construction access on the right side; left turn lane remains open). Current until 5 a.m. Saturday, April 6. Closure of FM 1957 (Potranco Road), Military Drive and Wiseman Boulevard at Loop 1604 for surfacing and painting work under the mainlane overpasses/bridges (closure of one intersection at a time). Current until Saturday, April 13. 6 a.m. until 7 p.m. Tarassa Drive intersection at FM 1976 closed for various tasks including milling and lime treatment. Current until Saturday, April 13. 6 a.m. until 7 p.m. Branching Court intersection at FM 1976 closed for various tasks including milling and lime treatment. Tuesday, April 9 until Saturday, April 20. 6 a.m. until 7 p.m. Glen Haven intersection at FM 1976 for utility work. Thursday, April 11 until Friday, April 12. Nightly 9 p.m. until 5 a.m. Alternating lanes of eastbound and westbound Evans Road, east of US 281, for striping work. Saturday, April 13 until Monday, April 15. Weekend alternating closure from 9 p.m. until 5 a.m. Alternating lanes of eastbound and westbound Evans Road, east of US 281 for striping work. Monday, April 1 until Wednesday, April 3. Nightly 9 p.m. until 5 a.m. Westbound-to-eastbound turnaround at US 281 to install bridge bents. DETOUR: Take the turnaround at Gold Canyon Drive, use the Redland Road entrance ramp to eastbound Loop 1604. Monday, April 1 until Wednesday, April 3. Nightly 9 p.m. until 5 a.m. Full westbound frontage road closure from the US 281 southbound frontage road to the Stone Oak Parkway exit ramp to remove bridge overhangs. DETOUR: take the turnaround at US 281, continue east and take the Redland Road turnaround, use the Redland Road entrance ramp and take the Stone Oak Parkway exit ramp. Monday, April 1 until Wednesday, April 3. Nightly 9 p.m. until 5 a.m. Full westbound frontage road closure from Gold Canyon Drive to US 281, including the northbound US 281 exit ramp, to remove bridge overhangs. DETOUR: take the double left at Gold Canyon Drive, take the double left at Redland Road, use the Redland Road entrance ramp, take the Stone Oak Parkway exit ramp and use the turnaround at Stone Oak Parkway. Sunday, March 31 until Monday, April 1. 7 p.m. until 6 a.m. One mainlane at Kitty Hawk exit ramp and at FM 1976 exit ramp for pavement repair work. Sunday, March 31 until Friday, April 5. Nightly 9 p.m. until 5 a.m. Southbound left mainlane from SH 218 (Pat Booker Road) to Kitty Hawk for barrier pinning work. Monday, April 1 until Tuesday, April 2. 9 p.m. until 5 a.m. Southbound exit ramp to FM 1976 for striping work. Sunday, March 31 until Friday, April 5. Nightly 9 p.m. until 5 a.m. One eastbound mainlane at I-10 cloverleaf ramps for milling and paving work. Current until Monday, April 1. Daily 9 a.m. until 5 p.m. Southbound frontage road right-turn lane at NW Military Highway for traffic island construction work. Sunday, March 31 until Friday, April 5. Nightly 9 p.m. until 5 a.m. One eastbound mainlane from SH 16 (Bandera Road) to Roger’s Ranch Road for permanent pavement marking installation work. Sunday, March 31 until Friday, April 5. Nightly 9 p.m. until 5 a.m. One eastbound frontage road lane from Babcock Road to I-10 (including intersections at Babock, Brennan Avenue and La Cantera/Peace Boulevard) for milling and paving work. Monday, April 1 until Friday, April 5. Daily 9 a.m. until 3 p.m. One westbound frontage road lane from Vance Jackson Road to I-10 for mow strip work. Monday, April 1 until Friday, April 5. Daily 10 a.m. until 3 p.m. One mainlane from SH 16 (Bandera Road) to I-10 for mow strip work. Monday, April 1 until Tuesday, April 2. 10 p.m. until 5 a.m. Full westbound mainlane closure from FM 2696 (Blanco Road) to Bitters Road for new Huebner Road turnaround bridge work. Tuesday, April 2 until Wednesday, April 3. 9 p.m. until 5 a.m. Full eastbound mainlane closure from NW Military Highway to FM 2696 (Blanco Road) for new Huebner Road turnaround bridge work. Current until Saturday, March 30. Daily 9 a.m. until 3 p.m. Alternating southbound frontage road lanes from Medio Creek to Red Musket for culvert, median islands and guard rail work. Monday, April 1 until Saturday, April 6. Daily 9 a.m. until 3 p.m. Alternating northbound mainlanes from Big Mesa to Medio Creek for sidewalk, curb, mow strip and rip rap work. Monday, April 1 until Saturday, April 6. Nightly 9 p.m. until 6 a.m. Northbound left mainlane from Big Mesa to Marbach Road for Overhead Sign Bridge (OSB) work. Monday, April 1 until Saturday, April 6. Daily 9 a.m. until 3 p.m. Alternating southbound mainlanes from Dove Canyon to Loop 1604 for sidewal, curb, mow strip and rip rap work. Thursday, April 4 until Saturday, April 6. Daily 9 a.m. until 3 p.m. Northbound left frontage road lane from FM 1957 (Potranco Road) to Wiseman Boulevard for resetting barrier work. Thursday, April 4 until Saturday, April 6. Daily 9 a.m. until 3 p.m. Southbound left frontage road lane from SH 151 to FM 1957 (Potranco Road) for resetting barrier work. Monday, April 1 until Wednesday, April 3. Nightly 9 p.m. until 5 a.m. Full northbound mainlane closure from the Frontage Road exit ramp to the Sonterra Boulevard entrance ramp to install steel girders. DETOUR: take the Frontage Road exit ramp, take a right on the Loop 1604 westbound frontage road. If going north; use the turnaround at Gold Canyon Road and take a right on the northbound frontage road. If heading west; drive along the eastbound Loop 1604 frontage road through the Gold Canyon Road intersection, use the turnaround at Redland Road, take the Redland Road entrance ramp and use the Stone Oak Parkway exit ramp. Monday, April 1 until Wednesday, April 3. Nightly 9 p.m. until 5 a.m. Full southbound mainlane closure from the Sonterra Boulevard exit ramp and the Donella Drive entrance ramp to install steel girders. DETOUR: take the Sonterra Boulevard exit ramp, drive along the southbound frontage road through the Loop 1604 and Donella Drive intersections and use the Donella Drive entrance ramp. Monday, April 1 until Wednesday, April 3. Nightly 9 p.m. until 5 a.m. Full northbound frontage road closure from the westbound Loop 1604 frontage road to the Sonterra Boulevard entrance ramp for bridge work. DETOUR: Go west on the westbound Loop 1604 frontage road, turn left on the southbound US 281 frontage road, take the Donella Drive turnaround and turn left on the westbound frontage road. Monday, April 1 until Wednesday, April 3. Nightly 9 p.m. until 5 a.m. Full southbound frontage road closure from the Sonterra Boulevard entrance ramp to the Loop 1604 westbound frontage road to work on bridge overhangs. DETOUR: take the Sonterra Boulevard entrance ramp, use the Donella Drive exit ramp, take the Donella Drive turnaround and turn left on the westbound Loop 1604 frontage road. Current until Sunday, April 7. Daily 9 a.m. until 3 p.m. Eastbound entrance ramp between FM 3351 (Ralph Fair Road) and Boerne Stage Road for ramp widening and lengthening work. Current until Sunday, April 7. Daily 9 a.m. until 3 p.m. Westbound entrance ramp between Boerne Stage Road and Dominion Drive for ramp widening and lengthening work. Saturday, March 30. 9 a.m. until 4 p.m. Right mainlane in both directions from FM 3351 (Ralph Fair Road) to Fair Oaks Parkway for ramp work. Sunday, March 31 until Friday, April 5. Nightly 9 p.m. until 5 a.m. Left mainlane in both directions from US 87 to SH 46 for median paving work. Monday, April 1. 9 a.m. until 3 p.m. Eastbound La Cantera Parkway/Fiesta Texas exit ramp (Exit 555) for concrete placement work. Monday, April 1. 9 a.m. until 3 p.m. Right mainlane in both directions from FM 3351 (Ralph Fair Road) to Fair Oaks Parkway (including Exit 546 exit ramp)for guard rail and mow strip work. Monday, April 1 until Saturday, April 6. Daily 9 a.m. until 4 p.m. Right mainlane in both directions from FM 3351 (Ralph Fair Road) to Fair Oaks Parkway (including exit and entrance ramps) for pavement work. Tuesday, April 2. 9 a.m. until 4 p.m. Westbound entrance ramp west FM 3351 (Ralph Fair Road) for chip seal and paving work. Friday, March 29 until Monday, April 1. 7 p.m. until 5 a.m. Full weekend closure of westbound frontage road from Loop 1604 to FM 1516. DETOUR: Westbound frontage road through-traffic takes Weichold Road to FM 1516, then FM 1516 south back to I-10..
Saturday, March 30, 12 a.m. until 9 p.m. Full eastbound mainlane closure at Foster Road for pavement improvements. DETOUR: All eastbound traffic exits at Foster Road, travels through the intersection on the frontage road and re-enters mainlanes past Foster Road. Sunday, March 31 until Friday, April 5. Nightly 7 p.m. until 5 a.m. Left westbound mainlane from Loop 1604 to FM 1516 and from Foster Road to just west of I-410 for construction truck access. Sunday, March 31 until Friday, April 5. Nightly 9 p.m. until 5 a.m. Left eastbound mainlane from just west of I-410 to Foster Road and from FM 1516 to Loop 1604 for construction truck access. Monday, April 1 until Friday, April 5. Daily 9 a.m. until 3:30 p.m. Left westbound mainlane from Loop 1604 to FM 1516 for construction truck access. Monday, April 1 until Friday, April 5. Daily 9 a.m. until 3:30 p.m. Eastbound-to-westbound turnaround at FM 1516 for overpass construction. Thursday, April 4 until Friday, April 5. 9 p.m. until 5 a.m. Full eastbound mainlane closure at Ackerman Road and Ackerman Road under I-10 for overpass construction. EASTBOUND MAINLANE DETOUR: All eastbound traffic exits at Ackerman Road, travels through the intersection on the frontage road and re-enters mainlanes past Ackerman Road. ACKERMAN ROAD DETOUR: Northbound traffic on Ackerman Road takea the eastbound frontage road to Foster Road and turns around. Southbound traffic on Ackerman Road takes the westbound frontage road to WW White Road and turn around. Sunday, March 31 until Friday, April 12. Nightly 8 p.m. until 5 a.m. Alternating southbound mainlane and frontage road lanes from US 90 to Valley Hi (mainlanes) & US 90 to Bertetti Drive (frontage road) for direct connector work (mainlanes) and road widening (frontage road) work. Sunday, March 31 until Friday, April 12. Nightly 8 p.m. until 5 a.m. Full northbound mainlane closure at US 90 direct connector for overhang and barrier removal work. Sunday, March 31 until Friday, April 5. Nightly 8 p.m. until 5 a.m. Southbound frontage road at Marbach Road for drainage work. Sunday, March 31 until Saturday, April 13. Nightly 8 p.m. until 5 a.m. Frontage roads (one lane remains open) in both directions at Marbach Road (including intersection) for overhang removal work. Monday, April 1 until Thursday, April 4. Daily 8 a.m. until 3 p.m. Southbound left frontage road lane from Zabra Drive to Bertetti Drive for truck access. Current until Tuesday, April 2. Full-time closure. Eastbound right frontage road lane from Carlitos Way to I-410 southbound for widening and excavation work. DETOUR: Traffic diverted to continue on US 90 eastbound frontage road, take the turnaround at Military Drive back to US 90 westbound frontage road and then take the cloverleaf ramp to get on I-410 southbound. Sunday, March 31 until Tuesday, April 12. Nightly 8 p.m. until 5 a.m. Full eastbound mainlane and frontage road closure between Hunt Lane and I-410 (mainlanes) and from Ray Ellison to I-410 (frontage road) for direct connector work. Sunday, March 31 until Tuesday, April 12. Nightly 8 p.m. until 5 a.m. Full westbound mainlane closure from I-410 to Hunt Lane for direct connector painting work and overhang removal work. Monday, April 1 until Saturday, April 6. Nightly 9 p.m. until 5 a.m. Full eastbound mainlane closure from ½-mile west of Loop 1604 to ½-mile east of Loop 1604 for barrier removal work. Monday, April 1 until Saturday, April 6. Nightly 9 p.m. until 5 a.m. Full westbound mainlane closure from ¼-mile east of Loop 1604 to ¼-mile west of Loop 1604 for various tasks including direct connector work, overhang removal work and light pole installation work. Sunday, March 31 until Friday, April 5. Nightly 9 p.m. until 5 a.m. Alternating westbound frontage road lanes from Military Drive to Callaghan Road for milling/overlay work. Monday, April 1 until Friday, April 5. Daily 9 a.m. until 3 p.m. Alternating westbound frontage road lanes from I-410 to Military Drive for mow strip and milling/overlay work. Monday, April 1 until Friday, April 5. Daily 9 a.m. until 4 p.m. Alternating eastbound frontage road lanes from Old Highway 90 to I-410 for guard rail installation work. City of San Antonio closure for Hardberger Park Landbridge project. Monday, April 1 until Friday, April 5. Daily 9 a.m. until 4 p.m. Right lane in both directions from FM 1535 (NW Military Hwy.) to FM 2696 (Blanco Road) for construction truck and equipment access. City of San Antonio closure for Hardberger Park Landbridge project. Saturday, April 6. 7 a.m. until 5 p.m. Right lane in both directions from FM 1535 (NW Military Hwy.) to FM 2696 (Blanco Road) for construction truck and equipment access. Monday, April 1 until Friday, April 5. Daily 9 a.m. until 3 p.m. Alternating lanes in both directions from Goodrich Street until Hamilton Street for raised median installation work. Monday, April 1 until Monday, April 8. Daily 9 a.m. until 4 p.m. Southbound right lane between Fox Knoll and Toepperwein Road for sidewalk and driveway repair work. Saturday, March 30. 7 a.m. until 5 p.m. Eastbound entrance ramp to Loop 1604 northbound for barrier placement work. Monday, April 1 until Tuesday, April 2. 9 p.m. until 5 a.m. Eastbound entrance ramp to Loop 1604 northbound for striping work. Monday, April 1 until Saturday, April 6. Daily 9 a.m. until 4 p.m. Right lane in both directions from Rigsby Avenue to Sinclair Road for sidewalk and driveway work. Monday, April 1 until Saturday, April 6. Daily 9 a.m. until 4 p.m. Northbound right lane from Rice Road to E. Houston Street for sidewalk and driveway work. Monday, April 1 until Saturday, April 6. Daily 9 a.m. until 4 p.m. Southbound right lane from Hunnicutt Drive to Lord Road for sidewalk and driveway work. Monday, April 1 until Saturday, April 6. Daily 9 a.m. until 4 p.m. Southbound right lane from Rice Road to E. Houston Street for sidewalk and driveway work. Monday, April 1 until Saturday, April 6. Daily 9 a.m. until 4 p.m. Westbound right lane from WW White to Bonair Road for sidewalk and driveway work. Monday, April 1 until Saturday, April 6. Nightly 9 p.m. until 5 a.m. Closure of FM 1957 (Potranco Road), Military Drive and Wiseman Boulevard at Loop 1604 for surfacing and painting work under the mainlane overpasses/bridges (closure of one intersection at a time). We've previously mentioned the tremendous challenge we face in terms of major utility (gas, water, sewer, electricity, fiber optic cable) work that needs be conducted before construction can start on the FM 1560 (Hausman Road) expansion project from Loop 1604 to SH 16 (Bandera Road). The project doubles the total number of lanes from two to four (two in each direction) with a raised median and sidewalk and bicycle accommodations. Well, the challenge is definitely manifesting itself and forcing us to make significant changes to the original plans. For example, the gasline under the roadway at the intersection of Hausman and Bandera has proven to be quite difficult. 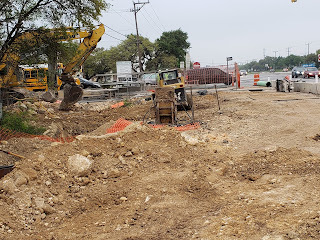 The contractor also encountered elevation conflicts at the sanitary sewer connections under the designated right-turn lane from Hausman to Bandera, forcing a temporary halt to work there and leading to the necessary slope redesign in order to maintain appropriate flow velocity. We know full well that it's that dedicated right-turn lane that has created a lot of public interest, since with the already narrow roadway, having to take that turn lane away leads to significant traffic congestion during peak times. Initially, our contractor had requested to keep the lane closed until today, hoping to have had enough time to get sufficient work done and be able to reopen it. Unfortunately, that has not proven to be the case and the reopen has now been pushed back to Monday, May 20. We know that is not what most of you wanted to hear. However, the extra pain for about two more months will hopefully prove to be more than worth it. The original construction plans had the right-turn lane closed for the entire duration of the project, which is estimated to be completed in early 2023 (the first phase involving utility work takes about 18 months). Considering the public impact of such a lengthy closure, we tasked our contractor with coming up with alternatives minimizing the lane closure time. Toward that purpose, we scrapped the original plans to the extent possible and instead the contractor will focus on completing all permanent elements (gasline tie-ins, water and sanity sewer adjustments and drainage crossing) impacting the right-turn lane over the next two months -- as opposed to doing a bit a time for the next three years. We truly appreciate the public's patience and understanding. But at least two months is definitely better than three years! Assuming all the work can get done in time, drivers should have a dedicated right-turn lane back in place by the end of May. 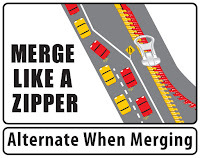 Is the "zipper merge" rude?